How do your kids do at cleaning their own rooms? My 13yo has never been terribly motivated to do it herself. When she was little, of course I did it for her. Then she got a bit older and she would do alright if I gave her 1-2 very specific tasks at a time in her room and stayed in the doorway. It got to where I'd threaten to clean her room if she didn't do it. This threat never bothered her. She knew she'd lose toys to donations and garbage, but it never bothered her enough to get it done herself. In more recent years, she has even been grounded until she got her room clean. (This wasn't in my own household.) It took her two long weeks to get it done! She just isn't terribly organized with her own things. She is away at Girl Scout camp for two weeks and I've wanted to get her room straightened up. She moved in with us a couple of months ago and claims she has NO room to unpack any more of her things. Admittedly, there isn't room for everything (at least not without using hangers) but there is room. She is not using her space effectively at all. She has been gone one week and I finally went in and worked on her desk today. So... do you consider cleaning your child's room a minimalist activity? I suppose it would depend on whether you get rid of anything when you do it. Speaking of which... 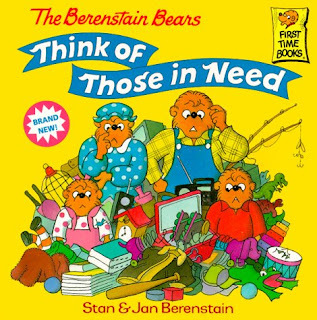 If you're trying to get little ones on board with minimalizing, you might try The Berenstain Bears Think of Those in Need (affiliate link). It helped a lot with Tyler when she was little. How do your kids do at cleaning their own rooms? Do you consider cleaning your child's room a minimalist activity? I do all of the cleaning around the house. Mine are still little though. They do help when I ask, or on their own. I find that amazing at their ages. We'll see what happens as they get older.